At Sanctuary you will meet a welcoming group of down-to-earth, everyday people who are devoted following Jesus and intentional about reflecting the Kingdom of God in all of its diversity. With Jesus as our model and the Holy Spirit as our guide, we are called in these trying times to pursue the pure heart of God. We aim to speak with compassion, serve with kindness, build bridges that unite us, and love extravagantly. Everyone who attends Sanctuary receives a warm greeting. Our greeters are available to answer your questions, help you get settled and find the appropriate places in the building. We have hot drinks like good coffee (or tea) in caffeinated form, sorry decaf people. Occasionally we throw in some other fun beverages. We love kids, and there are a ton of them at Sanctuary! 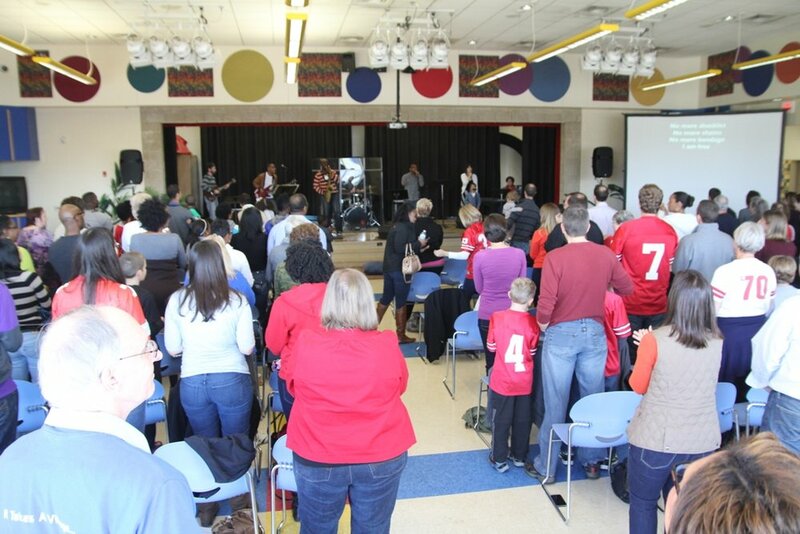 Adults and children sing together in worship as a family. Then elementary kids are dismissed to their classroom. Toddlers and Pre-K children are welcome to go directly to class before service begins. All of our children’s workers are background checked and look forward to teaching your child. Music is a language we can all understand. We sings songs ranging from traditional hymns, to original arrangements, to tunes you hear on the radio. Our music seeks to amplify the soul, reflecting our heart for God and hope for the world. We take communion (bread pieces and little juice cups) each week to remember Jesus' promise to never leave us alone. People call them lots of things...what is consistent is that this part of the service is geared towards hearing from God through scripture and seeking ways to apply the word of God to our everyday life. Our preaching at Sanctuary is geared towards helping you take the next step of faith in God. The service concludes with a time of response to message with personal prayer and offering. The best gifts we can give God is ourselves in loving service. The final word of the service is a blessing on our journey until we meet again next week. Join us Sunday Evenings at 4:45pm!